Iguazu Falls makes many people’s South America bucket lists – and why wouldn’t it? These grand waterfalls are a beautiful spectacle, truly one of the world’s most impressive natural water features set amongst the jungle and greenery. 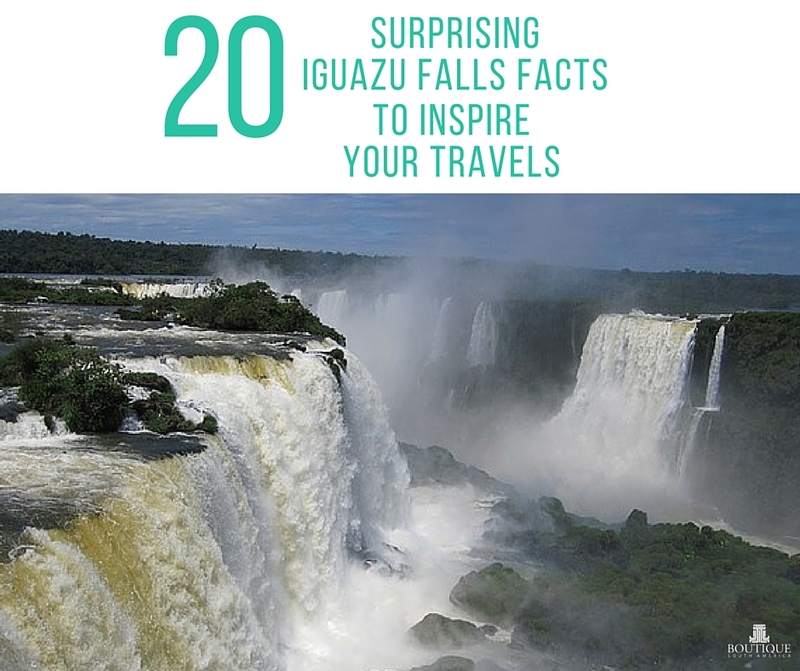 Below are some surprising Iguazu Falls Facts that will make you want to travel there. 1. There are a total of 275 waterfalls that make up Iguazu Falls. That’s a lot of water and why it is worth seeing from the various platforms and viewpoints as it looks different and spectacular from all angles. 2. Iguazu Falls lies at the border of Argentina and Brazil. Just like some other world famous waterfalls like Niagara and Angel Falls, this water filled natural wonder lies on the border of two countries. 3. The Parana is the river that the Iguassu waterfalls flow into. Iguazu Falls flows into the Parana River, which is a 4,800 km longer river that runs through Argentina, Brazil and Paraguay. It is the second longest river in South America, following the Amazon River. 4. Iguazu’s translation is ‘Big Water’. The word ‘Iguazu ‘is an incredibly accurate description of this natural landmark from Guarani (the native language of the locals of this region). 5. Iguazu falls is wider than Zimbabwe’s Victoria Falls. Iguazu Falls is 2700 metres wide across compared to 1700 metre wide Victoria Falls. 6. The magnificent Iguazu Falls spans nearly 3 kilometers. Well, the waterfalls are 2.8km long to be exact. So you have kilometres of potential exploring and viewing these waterfalls with a number of trails and viewing platforms. Don’t forget those walking shoes! 7. Nearly two-thirds of Iguazu Falls belong to Argentina. 8. More water flows through Iguazu Falls than any other waterfall in the world. 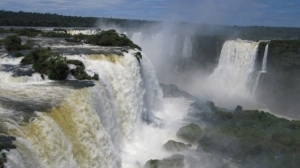 It is estimated that nearly 1500 cubic metres of water flow through Iguazu Falls each second. However, this can vary with rainfall and in 2014 there was nearly three times this amount due to heavy rains in Brazil. 9. Iguazu Falls is taller than Niagara Falls. One of the most surprising Iguazu Falls facts is that the South American waterfalls is much taller and also twice as wide as the more famous American/Canadian landmark. 10. You’re almost guaranteed to see a rainbow. Because of the constant spray of water in Iguazu Falls. 11. The part of the falls named Devil’s Throat is the point in which most of the water passes through. 12. Both sides of Iguazu Falls are quite different. One of the most common questions travellers ask is which side of Iguazu Falls to visit. Given that seeing the falls from the Argentinean side (with three different trail systems) is a completely different experience than viewing them from the Brazilian (panoramic) side, it is well worth exploring both sides if you have the time. 13. 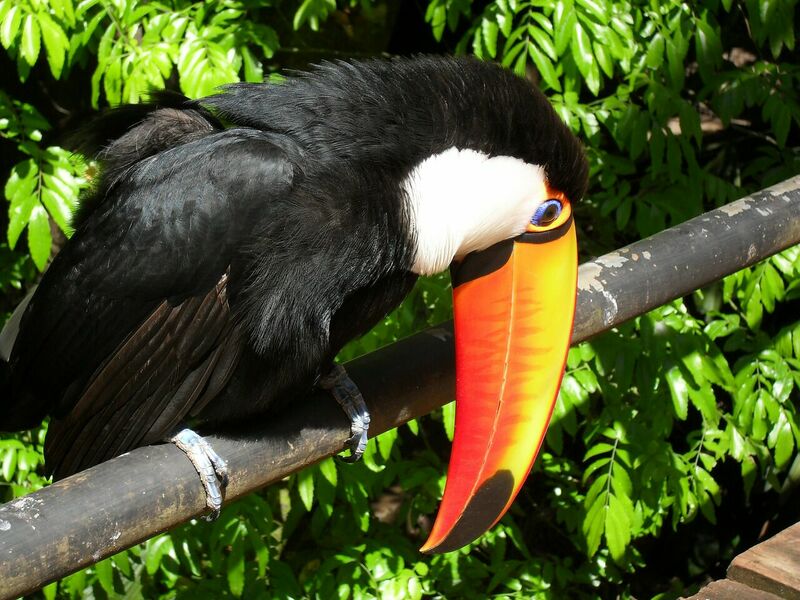 Iguazu Falls is not just about waterfalls but wildlife as well. A visit to Iguazu Falls can include some animal watching– coatis, capybaras, howler monkeys, jaguars and toucans are all native to the Iguazu region. 14. Seeing Iguazu by foot is beautiful, but it’s also accessible by boat! 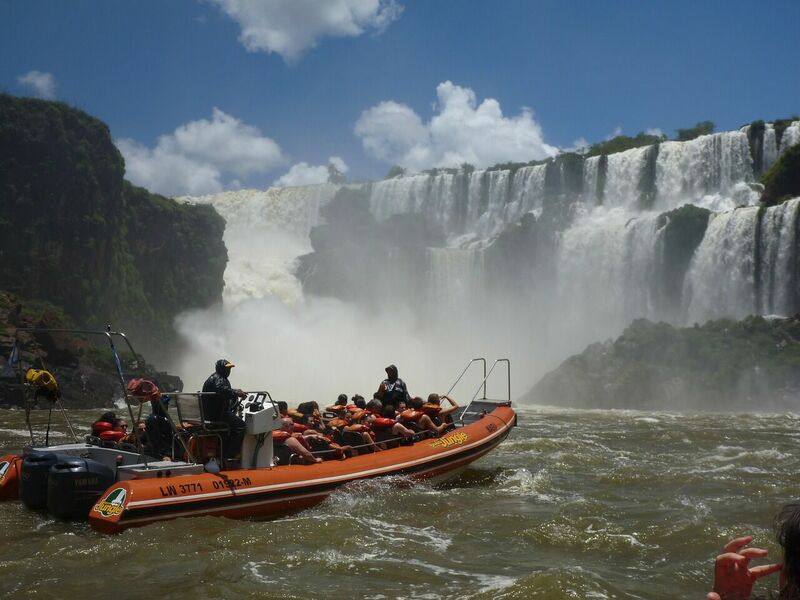 If you’re visiting the falls from the Argentinean side, a boating adventure with Gran Aventura is a must as they takes you as close as possible to the bottom of the falls – expect to get wet, no, soaked! And if you’re visiting from Brazil, don’t fret! Macuco Safari boats operate in the country and offer you a similar experience. 15. 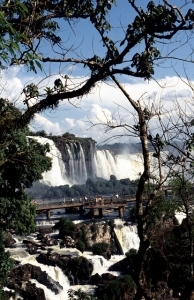 Iguazu Falls has a dramatic jungle setting. This also means the area surrounding the waterfalls is a protected are with reserves home to upwards of 2000 specifies of flora. 16. Iguazu Falls was discovered in 1541. Spaniard Alvar Nunez Cabeza de Vaca was the first European to record his encounter with the magnificent falls in 1541 and this natural beauty has been wowing visitor ever since. 17. Iguazu Falls was declared a UNESCO World Heritage Site in 1986. 18. 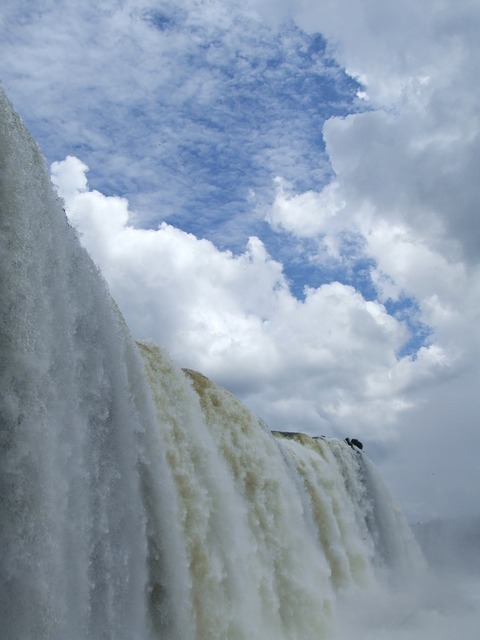 You may have seen Iguazu Falls on the big screen. 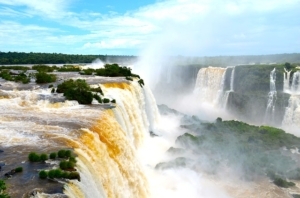 A surprising Iguazu Falls fact is the landmark’s casting onscreen as part of major films such as Indiana Jones and The Crystal Skull, Miami Vice and the James Bond film Moonraker. 19. Iguazu Falls is one of the New Natural Wonders of the world. 20. To be really impressed by Iguazu Falls, consider an overflight. Yes, it is possible to see Iguazu Falls by helicopter. This ride is taken from the Brazilian side of the falls but flies right over the most impressive part of the falls, the Devil’s Throat too! The helicopter flight to Iguazu Falls takes about 7 minutes but is absolutely incomparable.